In Paris he beat Harrwitz, the house professional, at the Café de la Régence.p128 He then won easily against Anderssen, who was a bit out of practice. One of his feats was simultaneous play against five strong players, winning two, drawing two and losing one. He had a great memory, and was able to play more than one game at a time. In one example, he played eight players at the same time; he did not have a chess board himself, and he could not see their chess boards. He simply sat in a chair facing the wall, and called out his moves, and was told what the other players had moved. In summary, he proved he was the best at that time. On his return home he toured the East Coast cities, accepting testimonials, banquets and applause. He wrote a chess column for a year in the New York Ledger in 1859–60. 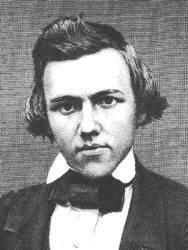 Morphy soon gave up chess, but his law practice was disrupted by the American Civil War (1861–1865). He was opposed to secession, and did not serve in the Confederate Army. Morphy traveled to Havana and to Paris, where he had a married sister, but refused invitations to play in public. His law practice never took off, and he never worked or played chess again. The last years of his life were marred by mental illness bordering on paranoia.Chapter 24 He suffered from distrust, obsessions and delusions, and showed erratic behavior. For example, he thought people were trying to poison him, so he only ate food cooked by his mother or sister. If he saw a woman in the street that he thought looked nice, he would follow her for hours. ↑ 1.0 1.1 1.2 1.3 Lawson, David 1976. 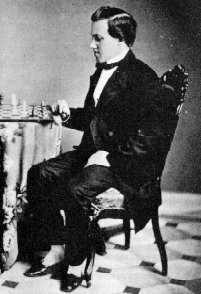 Paul Morphy: the pride and sorrow of chess. McKay, New York. ↑ The family name is a corruption of Murphy.